Correspondence (yes, actual letters !) and emails from Pittwater ex-pats continues to turn up in the Pittwater Online News offices - communicating how those who once lived here and are now in Belgium, Japan, Moree, Tarree, Tasmania and a thousand other places, check in here once a week to see what we've all been up to and 'check the weather'. This week, for all of you, and for all less mobile resident readers who like it when we take them on a wending 'stroll', a few pictures of what's been happening and where, as sent in by other Readers and some taken just for you and just for this week's Pictorial. As for the weather this week; hot, humid and brilliant to open the Sunday through Wednesday and Thursday - from Friday a cool change blew through and we've had some much needed rain on Saturday! We hope you enjoy these little insights and thank you very much for all your continued feedback and support. A few images and happenings from your 'other home'. 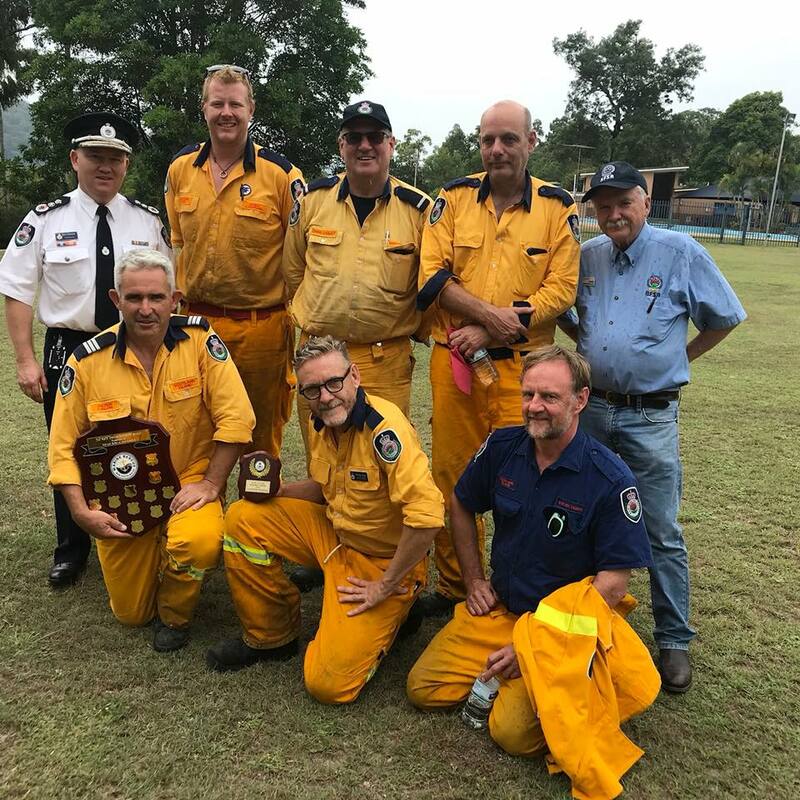 Today the brigade competed in the annual RFS Combined Districts Fire Boat Competition held at Milsons Island on the Hawkesbury River and won the inaugural Merv Collins Trophy. The trophy is named after the late Marine Rescue Hawkesbury Unit Commander and 24-year service veteran, who passed away in 2017. MRNSW Greater Sydney Regional Operations Manager Glenn Evans and MR Hawkesbury member Ken Bate presented the Merv Collins memorial trophy to the Scotland Island brigade's Peter Lalor, Captain of Scotland Island RFB. The competition required teams to complete 5 scenarios: controlling a marina fire, rescuing a sinking vessel, controlling a ferry fire, controlling an LPG fire and searching for and rescuing people missing in the water. SIRFB took the opportunity to practice using another boat - thanks West Pittwater RFB. Ten RFS boats, four MRNSW vessels and more than 200 personnel took part in the event. Great to catch up today with just under 200 members of NSW Rural Fire Service and Marine Rescue NSW participating in the 2019 Combined District Fire Boat Exercise on the Hawkesbury River. Always a day of healthy competition but more importantly, for refining and developing new skills in a spirit of shared learning and strong camaraderie. Thanks to all involved in making today possible, including the Rural Fire Service Association (RFSA) who once again were our key sponsor. Congratulations again to our winners and to all who organised and contributed to today. Commissioner Shane Fitzsimmons with SIRFB Members and RFSA President Ken Middleton. 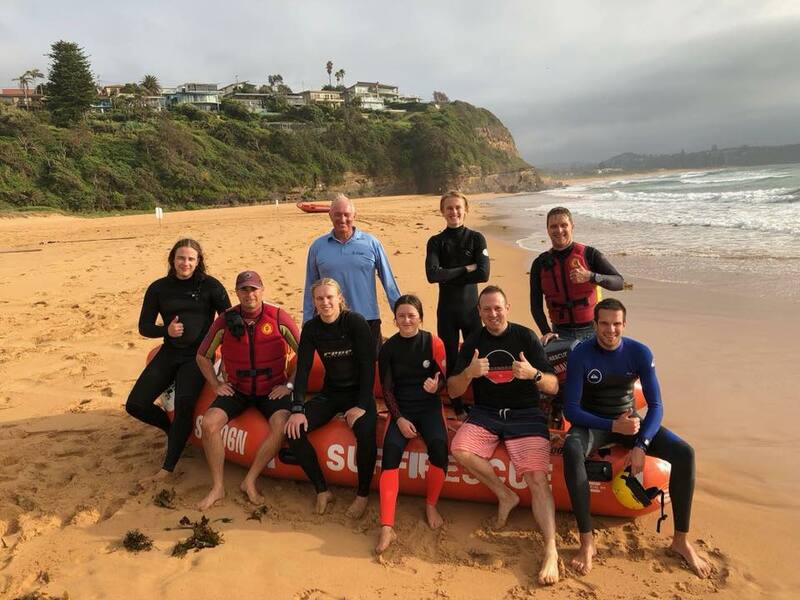 Volunteer crews from three Marine Rescue NSW units responded to a Palm Beach ferry that had run aground at Half Tide Rocks at the entrance to Brisbane Water, at 6.20 p.m. on Saturday night, March 9th. The ferry service was on its last run back from Ettalong to Palm Beach. 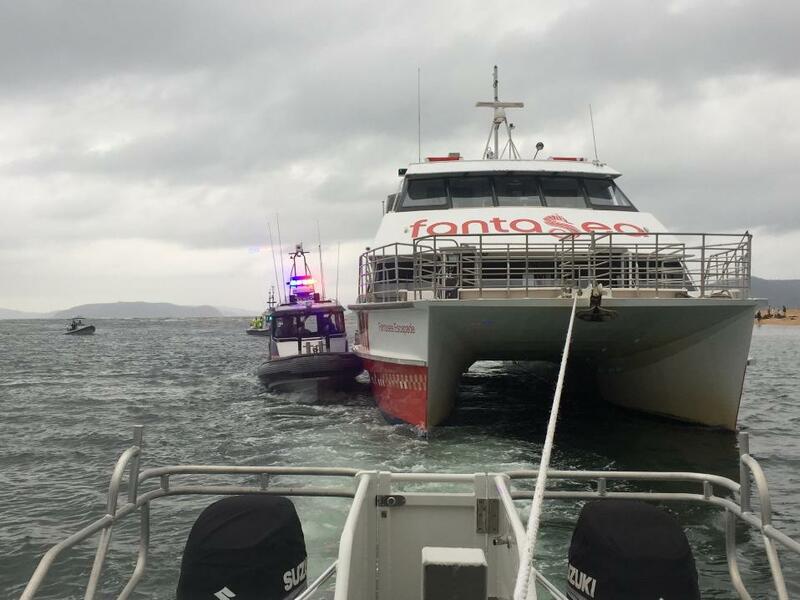 Rescue vessels Cottage Point 31, Broken Bay 20 and Central Coast 30 were deployed and assisted passengers, ferry staff and Police on the scene. One hour later a MRNSW Update: The ferry that earlier ran aground at Half Mile Rocks at the entrance to Brisbane Water is now safely on an emergency mooring and all Marine Rescue NSW vessels have been stood down. Thirty ferry passengers were safely transferred to shore before NSW Police vessel WP 42 and MRNSW vessel Cottage Point 31 relocated the vessel. Cottage Point 31 was able to secure a tow line to the ferry's bow and with all passengers removed and a solid 3 knot current, tow the large vessel to deeper water. All three crews from Marine Rescue Cottage Point, Broken Bay and Central Coast are returning to their bases. BYRA Races Are The TOPS! Despite the fact that Royal Prince Alfred had three courses on the go for the Optimist Travellers Trophy James the RO did find some space on the south pond to run BYRA's own Races Day. The Royal Motor was just finishing their last racer when we went out and the Juniors Optimists were on their last race so James was able to lay a fair course. There were six Lasers, three NS14’s and an assortment of boats sailed by the Juniors on their inaugural Silver Fleet. There was an Envy, (three up), a 29er, two Flying 11’s, two Open Bics and a Manly Junior. Close racing between the two Open Bics almost looked as though they were connected by a rope at times! The 29er did well, as the gusts were out to topple them ,which it succeeded in doing. An unusual sight on a Sunday afternoon was a Spinnaker launched from the Envy by the three lads on the way to the shore. The Juniors had two races the Seniors 3 or 4. For a change there was a wing mark that the Impulses took advantage of and started with the NS 14’s. Bruce in his shiny new Impulse seemed to be enjoying himself snapping at the heels of the three NS’, with the other Bruce trying hard to snap at the heels of Bruce if you understand what I mean. There would have been another NS but unfortunately he spilt his mainsail in a gust and had to return to shore. All agreed that BYRA races are Tops! Our thanks go to James the Race Officer, Committee Boat Driver, Flag Raiser,Timer, Scribe , Yes, he did it single handed. Not an easy task I assure you. And he cooked the Sausage Sizzle before the race too! This week’s race is down as another BYRA race but, subject to confirmation, RPA will be sailing and it will be a combined fleet day. The forecast as of Thursday is for a 10 knot or so breeze from the East. Just perfect for a big turnout of Senior members!! Crucifix Orchids have tough leathery leaves and long, thin stems with clusters of flowers. The common name refers to the lip of the flower called the labellum, which resembles a small cross. These are a great beginner's orchid - tough and easy to grow, with flowers that last for weeks. You may have seen the orange variety too. 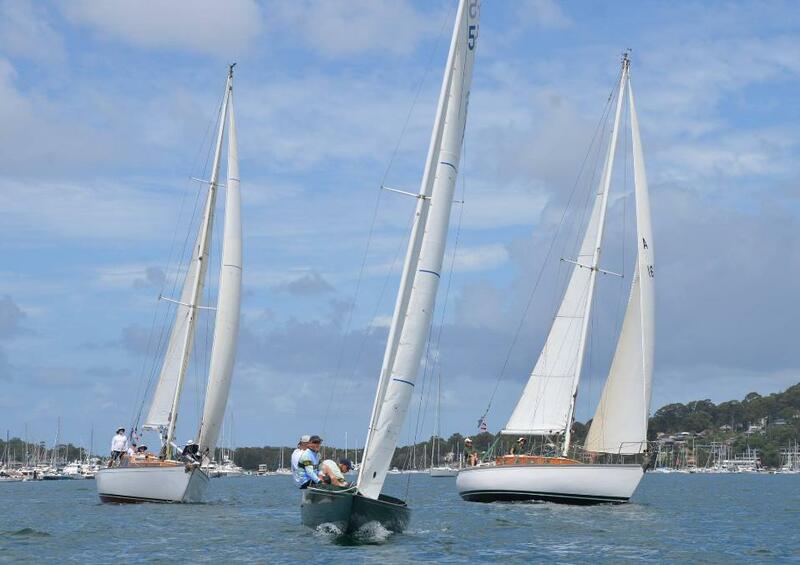 Last weekend the Royal Motor Yacht Club hosted the 2019 Classic Yacht Regatta. Day 1 greeted entrants with blue skies and a lovely breeze. The second day of racing began with lighter winds but sunny skies once again on Pittwater. 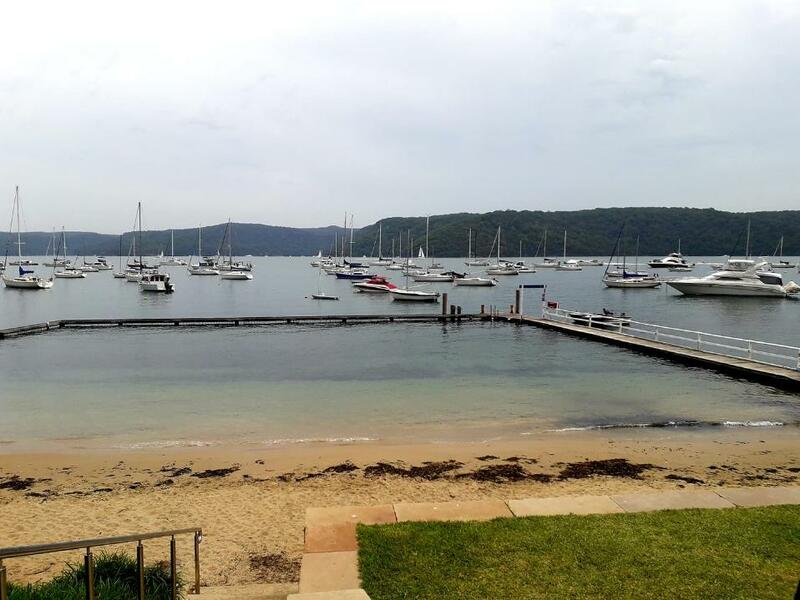 Photo by RMYC Broken Bay (at Newport). 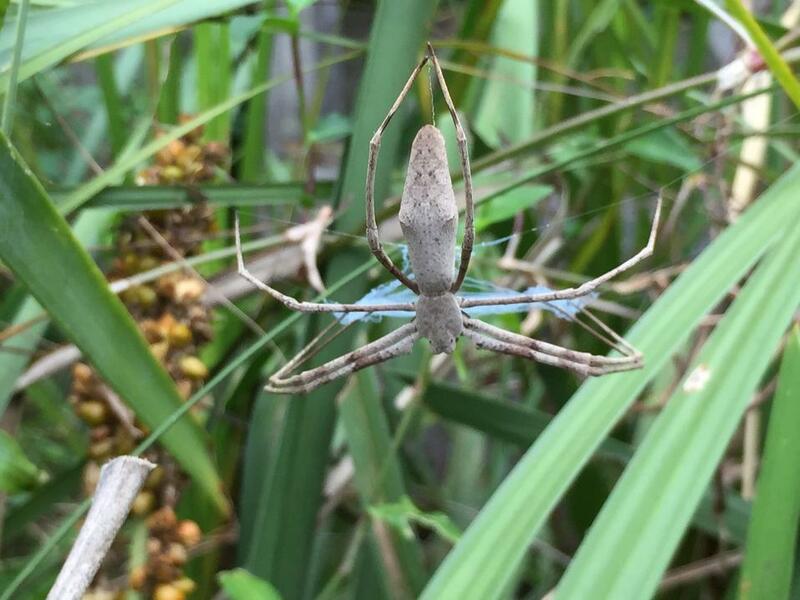 A Netcasting Spider, seen from the back. This spider's hunting method is to wait patiently with a rectangular web held between its first two pairs of legs. It has excellent vision. When prey comes near, it is captured in the web as the spider leaps. This one in North Avalon is in a Lomandra plant. They like to lurk plants with strappy leaves, including Cymbidium orchids. Colour can vary, be grey or rufous. 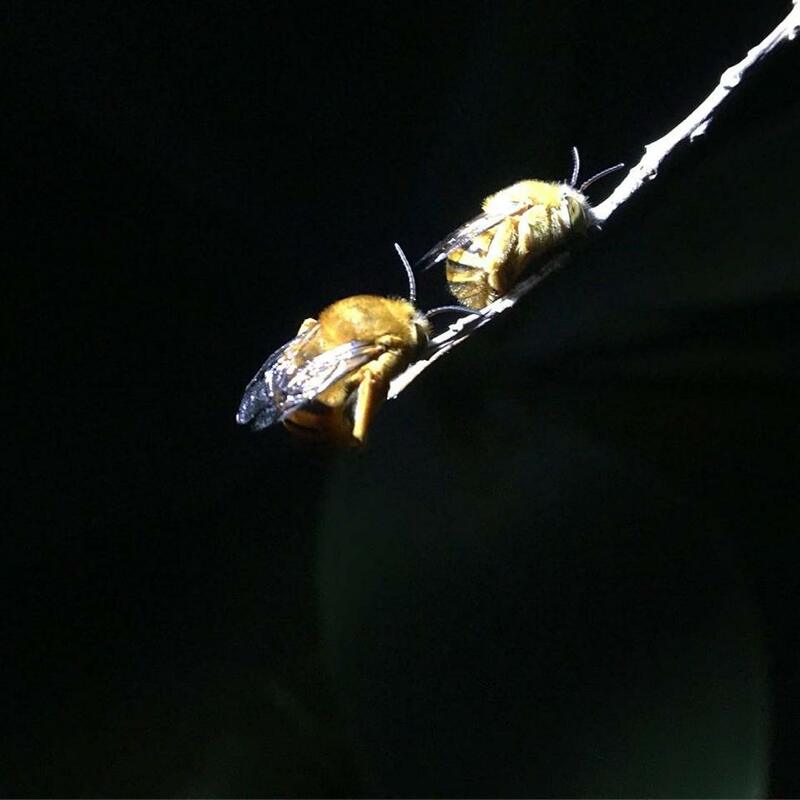 Spiders are always ready to escape, so net building spiders wait head down, able to drop to safety with a thread from the spinnerets in the abdomen. 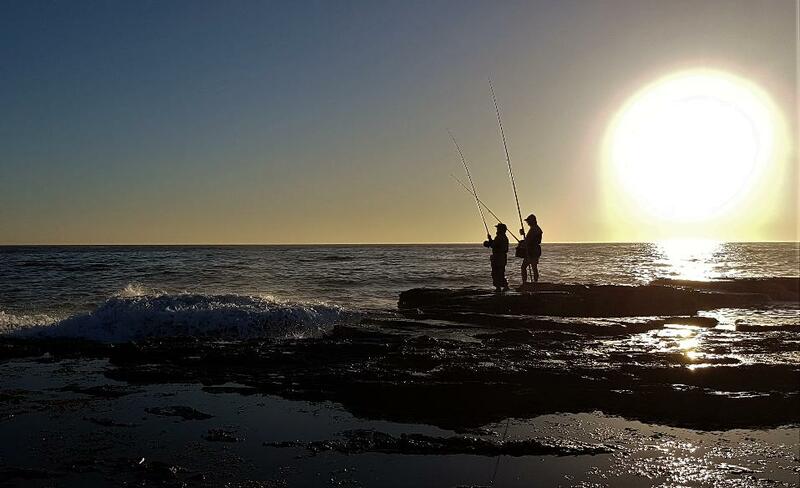 The public is being advised to avoid making contact with water discoloured by a marine algal bloom being reported in the Sydney region. Samples tested from the Manly area yesterday were identified as Trichodesmium erythraeum, a species not considered toxic but with potential to cause skin and eye irritations. 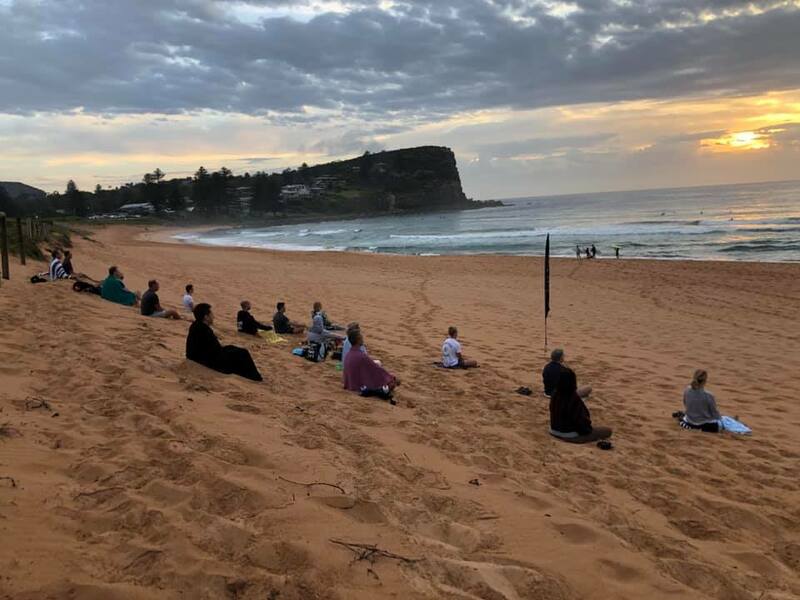 Reports of the bloom have been received along the coast from Palm Beach to the Illawarra. 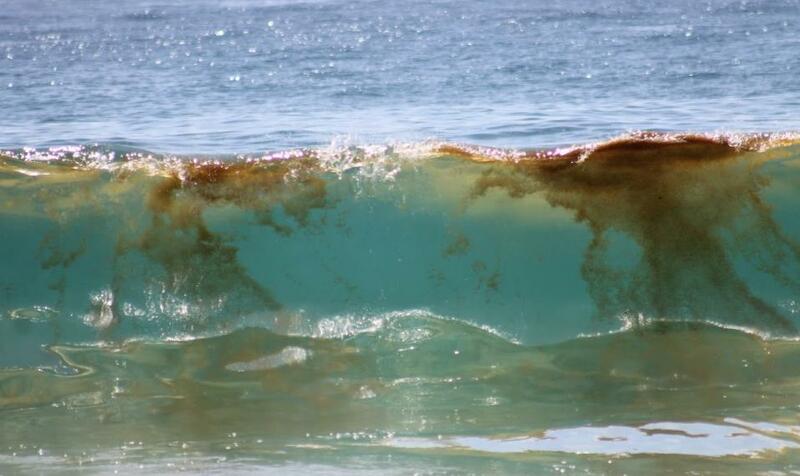 The algal bloom currently appears as a brownish discolouration throughout the water and can often be mistaken as an oil slick. In later life stages the species may be visible as a pinkish discolouration in the water. Generally, the health impacts of marine or estuarine species is largely unknown so caution should be exercised where blooms occur. Marine and estuarine blooms will often move with the wind and tides which means the bloom may present at different locations along the NSW coast. Trichodesmiumerythraeum occur in tropical and temperate environments and can move down the coast via the East Australian Current. Authorities will continue to monitor the bloom and advise the public as required. NB: Residents found the discoloration and oily substance still around this week too.